To be honest, last year’s rookie crop did better than maybe any NBA rookie crop in history. Many of the rookies outplayed NBA sophomores and we may never see rookies that help fantasy basketball players like that again. That being said, there are some very good NBA Rookies in 2016 and 2017 that you will want to plug in to your Daily Fantasy Basketball lineups at both DraftKings and FanDuel. Most of the rookies below will be coming off the bench so the best time to take advantage of them is when you know that they are getting a start because of another player’s injury or a rest game. It also takes a couple of weeks sometimes to get the rookies to get used to the pressure of playing on the NBA stage so you may want to be picky for when you will actually start to use them for your DFS lineups. If you haven’t joined DraftKings or FanDuel, take advantage of our signup bonuses and get access to free tickets and NBA Fantasy Basketball freerolls especially at the beginning of the season. 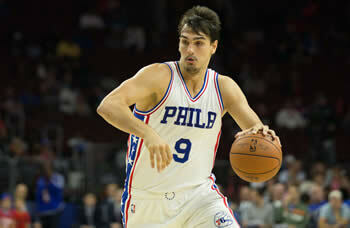 As a 76er he will get all the opportunities to be a starter and just play. There are no expectations in Philadelphia to win so Saric will have some awesome fantasy nights and some horrible nights but worth looking at for your lineup every night. Probably won’t be a starter but Hield will get plenty of minutes and opportunities to show what he can do. As a bench player he will have a lower cost at a site like DraftKings and worth taking when the matchups make sense. Dunn may not be able to crack the starting lineup and definitely isn’t taking Rubio’s job away but the Timberwolves are usually a team that plays a deep bench allowing for a lot of minutes to go around. Dunn will find some scores during the NBA Season. A rookie because he’s missed the last two years with an injury. Embiid now enters a crowded front court and will be brought along slowly to avoid more injuries. In the second half of the season he will make a nice low cost DFS starter to pounce on. Looked to be on track to be a starter and then the Lakers signed Luol Deng. So far in preseason games he hasn’t looked great but Ingram is a Deng injury (which happens enough) from getting starter minutes. You may need to wait a few weeks into the NBA season before looking at him for your FanDuel lineups but he will have some good games that you will profit from. Chriss has a chance to see a lot of minutes even as a bench player because he can play multiple positions including center. The Suns will give him the opportunity to play so take advantage. The Celtics have liked what they’ve seen from Brown and may start playing him more if they move Jae Crowder around the court. Brown won’t start but could still get 25-30 minutes a night. Murray has the game to play both guard positions and the Nuggets may just give him the keys to the car at some point and let him show what he can do. He will start on the bench but at some point he will simply take someone’s spot on the roster and start being a fantasy stud. Valentine has talent and could start on a lot of NBA teams but with the Bulls he has a lot of talent ahead of him. The good news is that Wade will need a bunch of nights off and certain nights Butler will too. Look for games where guys will be rested and then pounce on Valentine. Probably would have been listed in the top 2 but an injury has taken him almost out of the discussion for Top NBA Rookie of 2016/2017. He should be back this season (although he may not be) and if he returns you won’t see him become daily fantasy relevant until probably the end of the season when the 76ers will once again be looking at where they’ll end up in the NBA lottery.